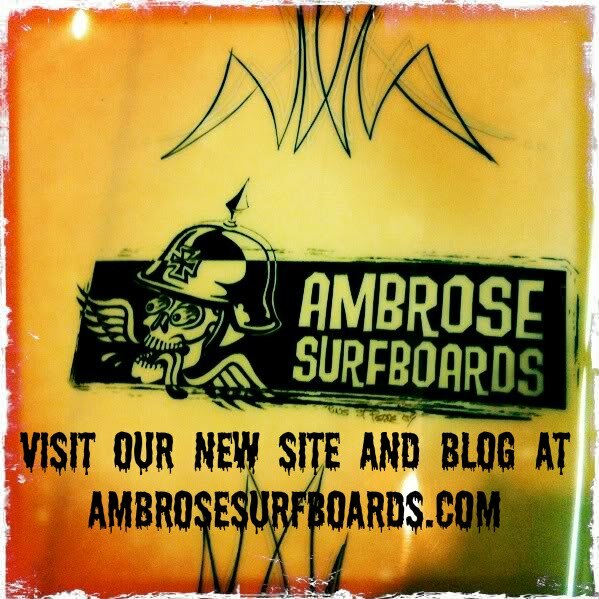 AMBROSE SURFBOARDS NEWS: WELCOME HOME!!! Here in Oceanside we definately feel the effects of the war mor than most areas. Case in point, a few years back I sold a board to a nice red faced guy , just off the turnip truck from Indiana,yup a marine.skip forward a couple of years and Andy had pretty much become a member of the family ,fast forwarding his surfing skills with many camping trips to churches and hanging with and becoming one of the boys.Before long Andy was was working in our shop on the weekends and learning how to laminate boards. 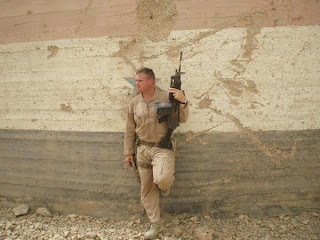 Then the reality of his job hit and he had to deploy to Iraq for the third time. This summer just was'nt the same without him around, funny but with our South gone (Andy South that is) there was also a lack of south swell activity around so cal this summer, and even when there was surf none of us really wanted to go to church without Andy, it just did'nt feel the same. It felt good hearing some respectful friends in the water thanking him for his service,more people should take the time to thank our military,who make how we live our lives possible. Hey maybe theres even some time for some late south's --but most of all -- welcome home bro!! I forwarded the link to some people in the City. There is going to be an article about this in our City newsletter. Someone is also calling the North County Times to see if they want to do a feature article about this blog and Andy. Cool huh? I'd give Andy a set wave anytime. 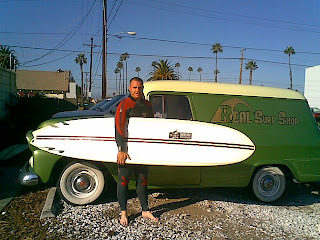 Thanks Shawn, Heather and everyone at Real Surf Shop for being so kind to me with this article. My family and I appreciate your words, as well as your actions, greatly. Churches was asskicking yesterday, huh guys...what a day! Thank you Andy. And congrats on the new family member! First one?